Consumer buying decisions are often taken by a single individual, while organisational buying decisions are the opposite. A number of people may play different roles in organisational purchase decisions. Therefore, it is very important for the marketers to identify and understand the composition of the buying group. In fact, a framework to do that is the decision making unit. 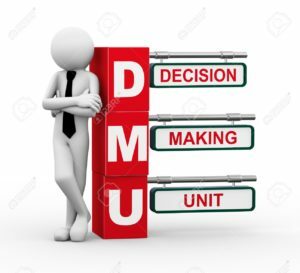 What is the decision making unit (DMU)? The decision making unit is actually a team of individuals who take part in organisational buying decisions. According to BPP Learning Media (2010) the decision making unit is all those individuals and groups who participate in the purchasing decision process, who share common goals and the risks arising from the decisions. Marketing researchers Webster and Wind (1972) call it a buying centre in an organisation (Kotler & Armstrong, 2009). It is worth noting that Robinson, Farris and Wind (1967) developed the concept of the decision making unit in 1967. Understanding the decision making unit of an organisation is very important for business marketers. This helps them prepare their sales executives to approach the right people in an organisation to make a sale. A number of factors impact on the purchasing decisions of business buyers. The business buyers are often influenced by organisational needs and their personal motivations and perceptions. Understanding these factors will certainly help sales managers design a perfect sales approach. According to Kotler & Armstrong (2009) the business marketers are not likely to know exactly what kind of group dynamics takes place during the decision process, although whatever information they can collect about personalities and interpersonal factors is very useful. How many individuals or groups in the decision making unit? The users refer to the people who ultimately use the product or service. As they are the users, they are mostly concerned with the performance and ease of use of the product or service. For example, employees are the users of a software bought for administrative work in an organisation. The influencers can play a big role in the evaluation of the alternatives for a product or service. They can influence the buying conditions by setting some preconditions. For example, lecturers may influence the selection of text books at a college or a university. The deciders choose the product. They have the responsibility to decide on product requirements and suppliers. For example, the head of a department of an educational establishment may decide on the number of text books to be purchased. These are the people who authorise the proposals of deciders and buyers. Senior managers may play the role of approvers in organisations. In fact, the approvers play a major role in the decision making unit. These are purchasers who have the formal authority to order a product or a service from suppliers. As they are the buyers, they negotiate the terms of purchase with the suppliers. A purchasing manager may take the roles of buyer (Kotler & Armstrong, 2009). The gatekeepers are in a position to control the flow of information in organisations. Consider the example of a personal secretary to the CEO of an organisation. Without the personal secretary, it may be extremely difficult for suppliers to approach the CEO. We hope the article has helped you explore the concept of the decision making unit. You may also like reading Decision making unit (DMU) for more examples and insights into the decision making unit. If you liked this article, please share it by clicking on the icons below.